We know how to survive the brutal Texas summer, do your trees and plants? Some trees, such as Live Oak, are survivors that can withstand extreme drought conditions and thrive with little or no care. Others may have a harder time dealing with the Houston weather. With the longest and hottest part of summer upon us, we can do some things to prepare our landscape. Mother Nature is getting ready to test our limits. Once you survive the month of August in Houston, everything else is a cake walk. Keep on reading so that you can keep your landscape looking nice and healthy this month. Watering: Continue to slowly deep water your landscape. Doing this encourages proper root growth and healthier looking plants. Mulch: Keep on adding mulch and then add some more! That’s right; mulching can keep plant roots cooler and keep those pesky weed seeds at bay. We recommend applying mulch 3-inches deep around trees and shrubs. Remember not to pile mulch against the base of the plant. We will also want to add compost around our annuals, herbs, and vegetables. How to Fertilize: This is the time to fertilize ornamental plants that need more nutrition due to leaching rains. Examine palm fronds for yellowing. If they are yellow, apply our Palm Juice. Prepare the soil for fall plantings by cleaning up debris and mixing in compost and fertilizer. Fertilize your flowering annuals and perennials. Lawn Care: Does your lawn looked stressed? If so, remove about one-half of the grass blades with a sharp mower. Doing this can reduce stress. Less stress is best! You will also want to stake any tall-growing plants. Pruning: If your shrubs look like they need pruning, do it. Lightly pruning shrubs can help any new growth to harden before the cold weather arrives. Keep removing any spent blooms and cut back overgrown bedding plants. Vegetable Garden: Let’s hear it for growing our food! Yes, homegrown food tastes better and is healthier. Plant broccoli, cabbage, cauliflower, collards, kale, and onions. You can also plant herb transplants such as rosemary, ginger, laurel, and Mexican tarragon. Get Ready, Get Set, Plant these Trees! You want shade now? We have mature specimen trees for sale! Our professional planting crew can plant all the best-quality trees that can create instant shade. Below are a few of our favorites for planting in August. 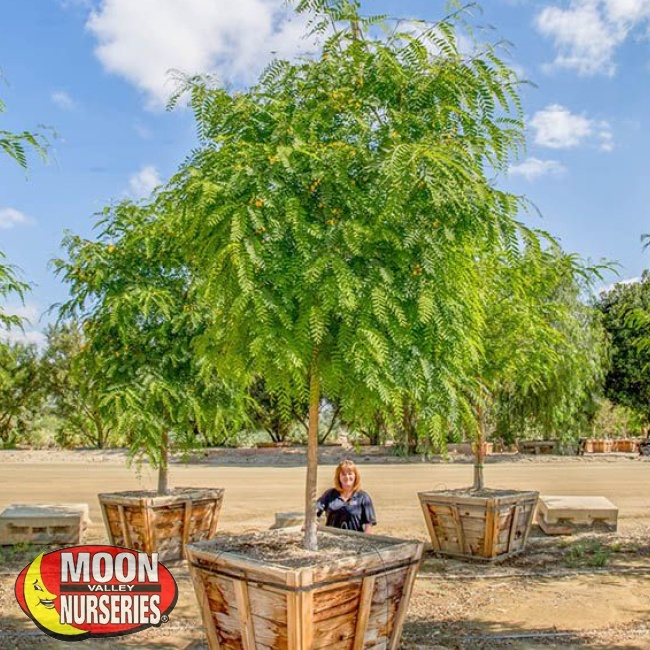 Visit your nearest Moon Valley Nurseries location in the Houston area and allow our nursery pros to help you select the perfect specimen. Oak Trees (Quercus): If you are looking to create a park-like setting in your landscape, you can do no wrong planting any of our Oak trees. 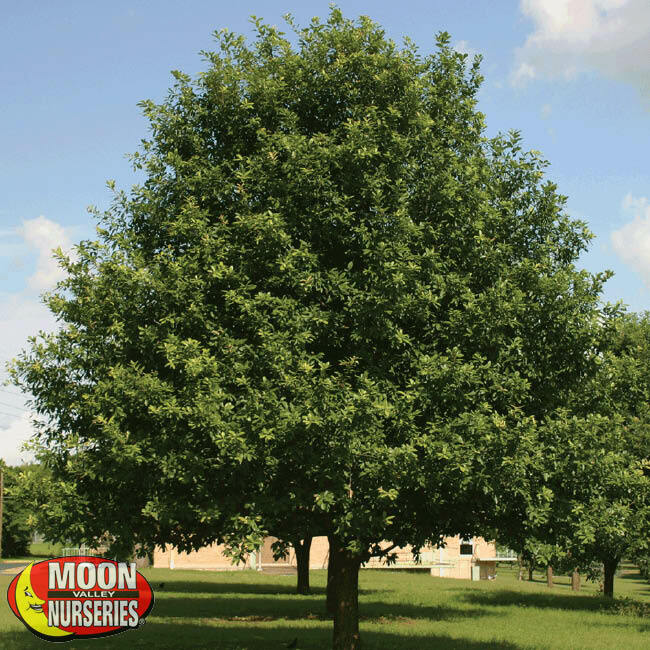 We have a variety of oak trees for sale, from evergreens to deciduous shade trees. Some of our favorites include Live Oak, Shumard Oak, Water Oak, Monterrey Oak, and Nuttall Oak. Live Oak, Quercus virginiana, is a large evergreen tree that holds its beautiful foliage all year long. When the days are long and hot, finding shade under an oak tree is going to be a welcome sight. Shumard Oak, Quercus shumardii, is a favorite deciduous oak tree valued for the shade it provides in the summer, and for allowing the sun to shine its warmth in the winter. Tipu (Tipuana tipu): Colorful flowering trees such as Tipuana tipu are prized throughout the Houston area. These semi-evergreen trees bring a splash of color and a tropical-feeling to landscapes. Mature specimens are a sight to behold, with feathery, bright bluish-green foliage creating an umbrella of shade. With one of these beauties in your yard, finding a sweet spot to cool off is easy. Late spring brings the arrival of the golden blooms, creating a beautiful contrast with the foliage. Butterflies are attracted to the Tipu tree, so get outside and enjoy the scenery! 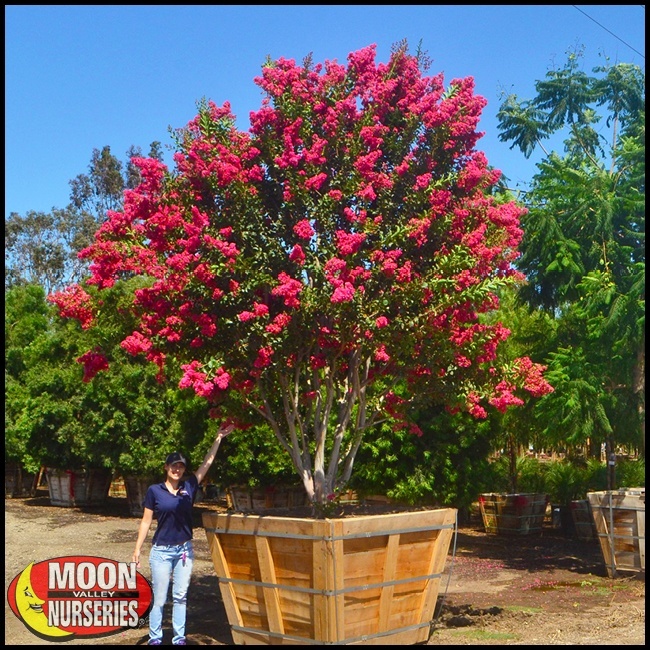 Crape Myrtle (Lagerstroemia): One of the best landscape trees for the Houston area is Crape Myrtle. Style is the word to describe these colorful flowering trees. And, since they never get too big, they can be planted in almost any location in your landscape. We custom-grow Lagerstroemia and only sell mildew-resistant varieties. Look for flowers that range from pink, red, purple, and white. Transform the look of any yard and plant these beautiful trees in your landscape. You’ll be glad you did! Magnolia (Magnolia grandiflora): When Magnolia trees are in bloom, there’s a sweet fragrance filling the air. Yes, these magnificent flowering trees have beautiful blossoms as well as glossy green foliage that can help make any Texas summer bearable. 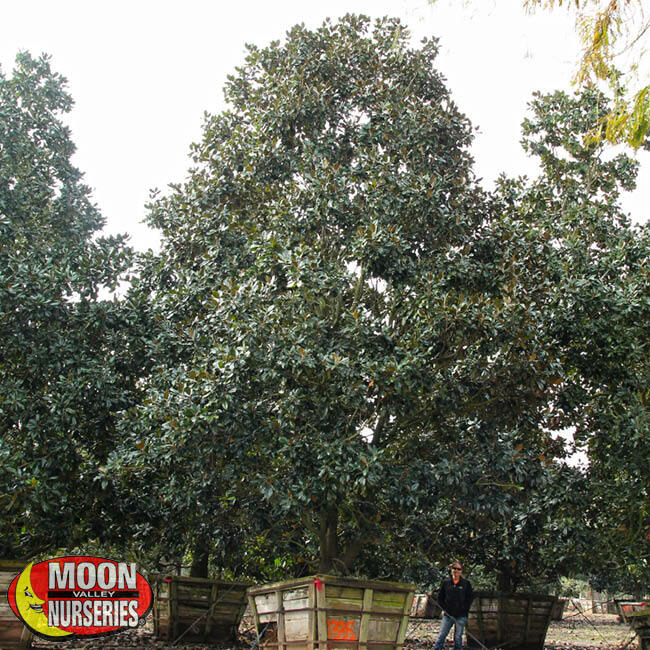 Magnolia grandiflora is the classic Southern Magnolia and one that can add year-round beauty to landscapes. Homeowners lacking yard space will want to plant the Teddy Bear Magnolia. The Teddy Bear Magnolias are easy to keep at a smaller size so that they can fit into tighter spaces. Plant any of the Magnolia trees we sell and enjoy the shade as well as the privacy they can create. 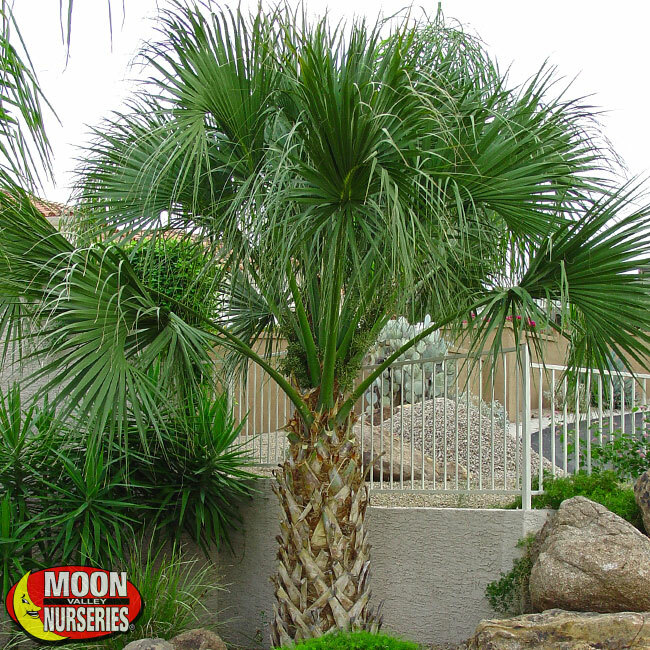 Sabal Palm (Sabal palmetto): If you are looking for a versatile palm, look no further than the Sabal Palm. These palms are very cold hardy, so they have no problem thriving in Houston’s climate. Plant them in your landscape to bring the look of the tropics, sub-tropics, or Mediterranean. These are the perfect palms for our area – they can tolerate standing water, brackish water, drought conditions, and require very little maintenance.